As many of you know, Calico recently sponsored our first blog giveaway for a one-of-a-kind Shara Porter clutch. We’re so happy that our readers loved the giveaway and left us tons of comments! Now for the results! Congrats, Jenni, and thanks for reading Calico’s blog! Please e-mail us by Saturday, February 13 to claim your prize. Be sure to include your address in your message, so we can ship your new clutch ASAP! We were so thrilled with the response to our Shara Porter giveaway that we’re wasting no time in launching another! Up for grabs this week is a super-cute necklace from Frozen Peas Accessories! This adorable horse pendant is hand-printed white leather with a small, brown feather accent. This contest has two-step entry process: First, comment on this entry and tell us your fave animal. Next, sign up for our e-newsletter (located in the right column of the blog.) You must enter the SAME e-mail for both your blog comment and your e-news subscription to qualify. Enter our Frozen Peas giveaway until Wednesday, February 15. The winner will be chosen the Thursday, February 16. And yes, this giveaway is open to international readers, too! This entry was posted in GIVEAWAY!. Bookmark the permalink. 16 Responses to "Giveaway City!" oh snap! I was eyeing this at the Selah D’or trunk show! 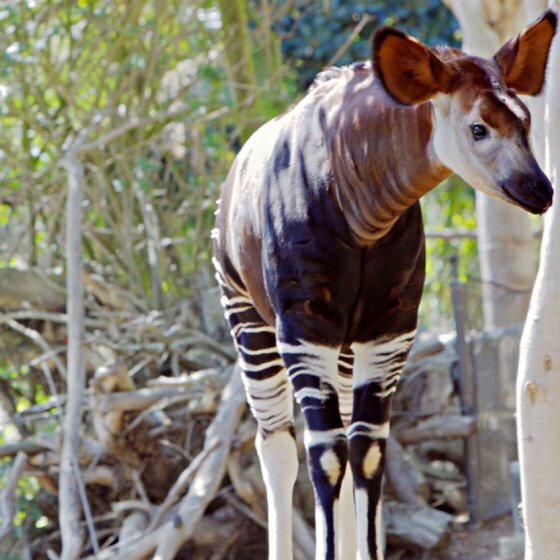 my fave animal is an okapi. yes, it is real…and it rules. I actually love Horses and my daughter is a NUT for them. This would be such a great gift for her! Since I was a child, always loved anything with horses and cats………very smart and regal! Gorgeous horse pendant! Thanks for signing me up! I love cats the most… am awake because mine wanted her ears scratched! I never thought I would like dogs until my parents brought home a black lab mix when I was 16. I love dogs of all shapes and sizes now!